This Winter will bring the remake of The Legend of Zelda: Majora's Mask where Link must save the world over a three day cycle that loops in a terrifying fashion, each cycle bringing life in the hopes of changing a doomed, stagnant world. It's a pattern of death and rebirth, where the Dawn of the Final Day looms menacingly as a paean, or eulogy, to the tribulations and sorrows of Termina's inhabitants. At the same time, it also represents one of the biggest gameplay evolutions the series has ever seen, a refinement of what already seemed perfect in the earlier Ocarina of Time. Link doesn't just get new weapons, but entirely different personas that expand the design opportunities and made for some truly creative gaming. With a new visual overcoat and a few more surprise changes for the 3DS remake, that day of reckoning will be here before you know it. Here are 12 reasons to get excited to relive the nightmare or experience it for the first time. Each mask represents a story—a myth of sorts—some tragic, some empowering. The traditional Japanese Noh is the oldest major theater art still being performed to this day, employing the use of masks to represent the metamorphoses of the characters. Empathy and identity intertwine in Majora's modernization of the ancient form. In Noh, the masks are carved from Japanese cypress and painted using natural pigments on glue and crunched seashell, whereas Zelda uses digital artistry to weave some of the strangest faces in gaming. Each mask has a unique sidequest that is sometimes fun and sometimes outright deadly. They're symbolic: some are transformations representing the idea of drastic change. Others express the personalities of their givers, as in Goron warrior Darmani's take on the Noh form, Shura mono, which in Japanese tradition has the ghost of a famous samurai begging a monk for salvation (more on this in the Goht section below). Many hold special abilities such as concealing characters' true identities — a major aspect to the layering of Majora's Mask's already complex story. Others are not without their weaknesses, much like Link's lonely arrival in Termina and that moment he loses just about everything. These weaknesses do their best to challenge him in the puzzles he takes on. Others are tied to the heart-breaking missions that make Majora's Mask an extremely personal story for Link. Bunny Hood: Probably one of the most useful masks in the game, it accelerates Link's speed by 68%. In a game where every second counts, 68% amounts to a lifetime. Stone Mask: This kodama-looking mask makes you invisible to most enemies and villagers. It's gained from a soldier who's desperate for attention but is being ignored by everyone around him. Nothing like a potion to prop up a stranger's confidence. Blast Mask: Aside from the fact that this lets you create explosions from your face, the quest to gain this mask represents the first time in the Zelda series that Link can actually kill a non-playable character. Couple Mask: Kafei and Anju are in love. But Skullkid curses Kafei by turning him into a child. The most useless mask takes the longest time to gain. But the chance to connect these mismatched lovers is also one of the most emotionally resonant sidequests in Majora's Mask. Fierce Deity Mask: In Noh plays, one of the main forms, Mugen Noh, often presents time in non-linear fashion, giving us deeper insight into the supernatural. Link's final mask, the Fierce Deity, is said to belong to a dead god who was also Majora's principal adversary. In some ways, their struggle is reflective of the daily struggle Link experiences, and ultimately the cycle all of Termina is locked into. It's not the fact that there's a time limit (even if it's one you can manipulate) on saving the world. It's not that there's a hideous, murderous looking moon about to crash and destroy Link, Termina, and all its citizens. It's not the Salesman whose face can turn from an unsettling smirk to a demonic cringe in an instant. It's all of these things put together that incite panic while stirring up a sense of constant pressure to overcome the heavy burden of being aware of impending destruction. And what is the reaction to this apocalypse? Many are either oblivious to it or in downright denial. Majora's Mask is part social commentary, part excavation of the human soul. The fear we feel for Termina's Survival is tied in with our own awareness of mortality's march. And while theories that Link is actually dead may or may not be accurate, they make the survival horror aspect of it painfully acute. Given only eighteen months to develop a sequel to Ocarina of Time, Eiji Aonuma and team could have done more of the same, expanding on OOT and keeping the game mechanics more or less identical. Instead, they decided to take the series in a completely new direction. The repetitive three day cycle can be daunting, but damn, if it isn't a brilliant mechanic. It remains one of the most innovative types of gameplay we've encountered in a game, doing just enough to change fate for three grueling days. Righting one of multiple wrongs in Termina, only for it to ultimately be reset, could have turned gamers off. But the designers gave Link enough tools—like the inverted Song of Time that slows time to a crawl at a third of the normal speed—for it to become an effective, even welcome mechanic. It also helped that banks mystically stored Link's rupees with every repeat. The perishables, like bombs and arrows, were easily replenished wherever they were needed. Contrary to people's critique that Majora limited time, the cycle insured unlimited time in the world with its repetition, albeit constrained to 3-day morsels (that's why all these years later, we were able to load our N64 cartridge of Majora and re-play every level and interaction with all our equipment and powerups intact). Its manipulation and reasons for existing were executed wonderfully, especially with the stakes so visibly palpable (the moon crashing from above). It's a seemingly small twist where these tiny design choices contribute to the resolution of a larger design, but as noted before, the pressures that came with it made for excitement on a heart-pounding scale. It also emphasized the details of the characters by allowing players to experience the events and interactions as many times as they wanted. Whereas Hyrule from Ocarina seemed more expansive, Termina was deeper with layers stripped away with each renewal of the cycle. We can think of plenty of villagers and townspeople we actually cared about in Majora. You could care about the world on an individual level, rather than the more ambiguous task of saving the world. Then there is the actual time travel presented in a blinding white surrounded by the 72 hours on a spiral stream of clocks mocking and unraveling all your accomplishments. Link's slow, dreamlike, quiet, eerie fall is a disconcerting descent to the past when the madness begins again. The Murderous Faced Moon… baring teeth and sporting bloodshot eyes; this thing still has the ability to give us nightmares. Surprisingly, when Link actually arrives on the surface, it's a grassy field and an idyllic paradise that expands interminably out from its central tree. It's such a striking contrast to the intent stare and the ominous craters that it leaves us wondering: if this Moon were to appear in the sky one day and start plummeting to earth, would we appeal for mercy, hoping not to get crushed under its gaze of terror? Or is the Moon the ultimate mask, a misunderstood freak of nature forced into a collision course drawn by the gravity of people's suffering? While there are only four main dungeons in Majora's Mask, the ones in the game have some of the most creative levels ever designed. The Stone Tower Temple still stands out as one of the best in the series as it incorporated the use of all the masks. Playing through it in its initial layout is complex, switching between all three of the main personas and performing elegies to make copies of yourself. But halfway through, you invert the whole dungeon so that it's upside down. We experienced this in Castlevania: Symphony of the Night, but were amazed at the flow of this inverted dungeon in 3D after the acquisition of the light arrows. Link has to use his Deku form to fly over huge chasms, boulder his way through lava as a Goron, and swim through the underwater corridors as Zora. It's a design decision that is symbolic of the game as a whole, flipping expectations and twisting Zelda in a way that hadn't been done before while integrating all new mechanics. It's also a testimony to the designers that the level works so seamlessly, all the way to the final battle with Twinmold, a gigantic insectoid. Fortunately, you have a Giant Mask that allows you to equalize the battle. If only I had that mask in Shadow of the Colossus! The Goht is cursing all of Snowhead with a long winter. As much as we like the other boss battles, Goht is unique in the way it incorporates the Goron Mask. Link obtains the mask from the ghost of Darmani, a great warrior who met a tragic end while trying to reach the Snowhead Temple. Emblematic of the ultimate meaninglessness of his past conquests in the face of the blizzard, Darmani's sacrifice is even more bittersweet considering the amount of strength it gives Link. The Goron form grants him the ability to roll up into a deadly ball to obliterate his foes. It's also key to the boss battle with the mechanical bull-like monster that is Goht. They race around the arena, Goht in a mad stampede tossing boulders and stalactites to impede Link's path. In a recurring motif, the two go round and round, a cycle connecting them in a literal struggle of life and death. What makes this battle stick out is that it goes against the typical Zelda formula of finding a weapon in a dungeon that you then use to defeat the given boss. This was almost purely about combat in Goron form, a staggering test of wills, and the redemption for Darmani that he was never able to achieve in his life. With Goht's death, winter ends, at least for three days. These brothers are vicious and mean-spirited, mocking Epona ("Is that pathetic thing your horse?") and even gloating after Romani has her cows abducted despite selling watered down milk. If Link helps Cremia deliver milk at night, they'll attack and break the bottles, sabotaging her whole business. But they're deeply affected by the sight of the Circus Mask, an image of the brother who left them. So much so that they won't attack Cremia at night if he's wearing the mask and even asks Link to remove it. The tale of the Gorman brother who left is one of failure and disappointment. Leader of the circus troupe, he doesn't have the heart to tell the performers the Carnival is being cancelled because of the moon. He starts wondering if his decision to give up the farm life to pursue his dreams had been a mistake, drinking his woes away at the Milk Bar. That's when Link gives a performance of the Ballad of the Wind Fish (originally from Link's Awakening), moving Gorman to tears and reminding him of why he had wanted to start a troupe in the first place. All these subtle emotional arcs and character interactions are part of what makes Majora so special. Even when characters have epiphanies, the time repeat locks them back in the same pattern, evoking a sense of vanity and futility despite all of their struggles against it. If we're thinking about things according to game release dates and not Zelda Universe time lines, then there's been a hand in the toilet before, among other strange bathroom related things. We don't know why there is a hand called ??? residing in toilets at the Stock Pott Inn, nor would we like to imagine what's attached to that hand, but that's not what's important. What's important is that the hand has a need and needs a deed. Unlike Oracle of Ages, where all you get is a stinky bag in exchange, this time around, you get a piece of heart. We liked the hand because it was completely optional, indicative of the bigger nightlife with characters that had schedules of their own, a nod to the weird meanderings that happen at night. Miyamoto would later state that ??? was a tribute to Japanese horror films that would make even toilets a place of terror. Consider us scared. There is something strange going on at Romani Ranch at night and we don't mean the nickname Romani gives Link, "Grasshopper." Go on the third day and Romani has amnesia, barely speaking. Only if you go back to the first day do you find the real culprit, an eerie "They" who are kidnapping cows, and possibly performing lobotomies. It was one of the creepiest and most surreal moments in a Zelda game. Oh, and even if you do save her, repeat time again and the same fate awaits her. 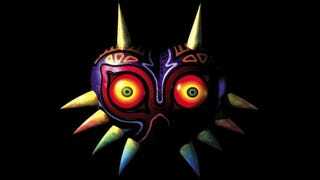 Meditative, catchy, and haunting, the music from Majora's Mask by Koji Kondo was some of the best in the series. A huge part of it was because it was so emotional and this was nowhere more apparent than in the changing theme of "Clock Town." Starting with the peaceful and unaware strums of village life on the first day, it gradually shifted into an accelerated melody on the final day with ominous undertones threatening to override the main track. The "Giant's Theme" hints at the ancient tragedies that mar Termina, but at the same time, sing of its beauty and grandeur. The deeply moving "Song of Healing" presages moments of reconciliation and peace with the citizens and Link's role in bringing it about. There are the catchy songs as well, from the return of the original overworld track, to the celestial beats of "Astral Observatory," and the strange glory of "Deku Nut's Palace." The tension heightens with the trumpets and drumbeats of "Pirate's Fortress" and the immediacy of "Mayor's House Conference Room" playing over a fierce debate about the fate of Termina. Link is often cited as the ultimate example of a silent protagonist (putting aside Fujiko Takimoto's various grunts as Link). But in Majora's Mask, his ocarina became his voice, acting as chorus to the drama of Termina. The music as a whole served to create an auditory bridge between all the separate parts. If it sounds like a mini-horror story chapter of a greater narrative, it is. It's one of the many ways in which Majora's Mask is largely cited as being grimmer in tone, if not the darkest entry, in the Zelda series. As bleak a game as this is, there's also a great deal of humor, some of it verging on strange, as in this case of a product of childhood playfulness. It's ironic, really, because Kamaro died full of regret that he had not passed on his dancing techniques to the world. He remains a ghost in Termina, wanting not to be forgotten, and hopes to achieve this by teaching Link his dancing moves. Link, in turn, passes on Kamaro's technique to a pair of siblings in a circus, the Rosa sisters. Kamaro's dancing prowess reached us as well in the real world where our childhood selves, along with siblings, engaged in impromptu dance sessions to re-enact his dance — one of the parts that remained especially poignant for making us laugh. This was also the moment when we realized we were no longer just defeating enemies, hunting down heart containers, and going on fetch quests in typical Legend of Zelda fashion. We were dancing in a Zelda game as Link. For every reason stated on what makes Majora's Mask great, there are dozens more that could take their place. They're in the writings and interactions of the characters — full of life, bordering on death — and in the new hopes that the flow of time brings. N. Ho Sang has made contributions to Entropymag and SF Signal. She is currently a regular contributor to Talk Amongst Yourselves, rambling about life, and RPGs under the username Zarnyx. She can also be found on Twitter under the title @Zarnyx. Peter Tieryas is a VFX artist who just worked on Guardians of the Galaxy and Cloudy With a Chance of Meatballs 2. His novel, Bald New World, was listed as one of Buzzfeed's 15 Highly Anticipated Books and Publisher Weekly's Best Science Fiction Books of Summer 2014. He scribbles about RPGs at tieryas.wordpress.com.